The gains of economic growth from 2012 to 2013 passed over low- and moderate-income North Carolinians for yet another year, according to data released by the US Census Bureau last month. Poverty and stagnant living standards in North Carolina have become the norm during the current economic recovery. High rates of hardship persist because of the state’s ongoing job shortage and the rapid acceleration of low-wage work that fails to provide a pathway to the middle class. A glimmer of hope exists, however. The poverty rate would have been much worse in the absence of public policies that provide necessary support. US Census Bureau data show that work and income supports blunted the extent of poverty’s reach across the United States. Using an alternative poverty measure, the Supplemental Nutrition Assistance Program (SNAP), Unemployment Benefits, and Social Security helped keep poverty in check by lifting millions of American above the federal poverty line. That’s an annual income of $11,490 for an individual and $23,550 for a family of four in 2013. 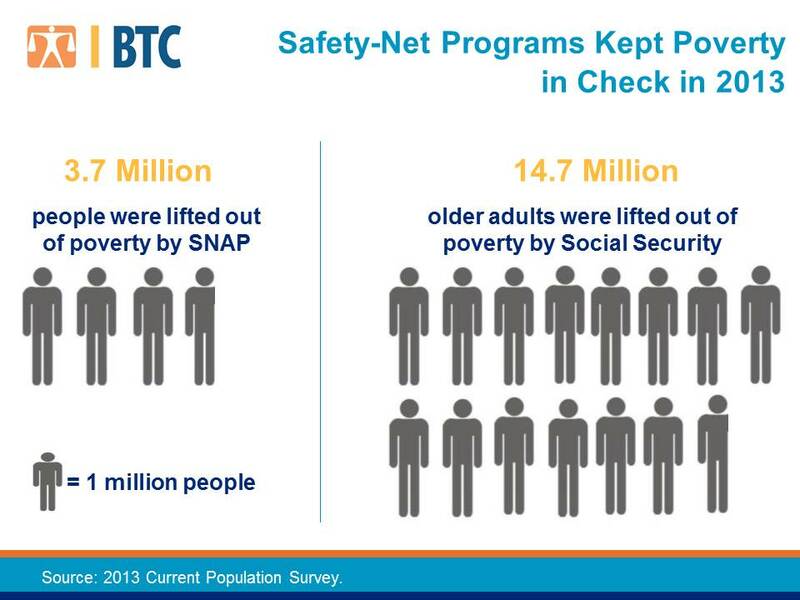 SNAP, formerly known as food stamps, lifted 3.7 million people out of poverty and helped them meet basic needs, as illustrated in the graphic below. Social Security benefits lifted 14.7 million older adults out of poverty—put another way, the number of older adults struggling to make ends meet would have quadrupled in 2013 without Social Security benefits. Unemployment insurance benefits kept 1.2 million people out of poverty. The Earned Income Tax Credit (EITC) also has a strong anti-poverty impact, but 2013 statistics won’t be available until later in the year. If not for the federal EITC, an additional 5.5 million Americans—including 2.9 million children—would have lived in poverty in 2012. These findings are particularly noteworthy given several misguided policy shifts at the state and federal levels. Last November, federal lawmakers made deep funding cuts to SNAP, shrinking benefits for 1.7 million North Carolinians totaling $166 million in the fiscal year that ended last month. In July 2013, state lawmakers cut unemployment insurance for jobless North Carolinians, making it harder for them to make ends meet as they try to gain a foothold on the economic ladder. And last March, state lawmakers axed the state EITC and passed a tax plan that shifted taxes away from the wealthy and profitable corporations and onto everyone else. Put simply, cutting SNAP—and other work and income supports—increases economic hardship for families and children as parents face difficult tradeoffs between food and other essential needs like rent, utilities, and child care. Chipping away at the safety net before the economy fully recovers—as state and federal lawmakers have done—only makes the day-to-day lives of vulnerable populations more difficult. Until public policies are put in place that close the job shortage, lift wages closer to a living wage, and spread the economic gains more broadly, keeping a robust safety net system is important to reducing poverty. See the 2014 State of Working NC report for detailed policy solutions that will build an economy for all. This is the eighth post in a series that takes a detailed look at the 2013 US Census Bureau poverty data released on September 18th. Previous posts examined: 1) how North Carolina is faring overall; 2) how poverty varies by race, 3) poverty by County; 4) child poverty; 5) the impact, or lack thereof, of the current economic recovery on poverty in our state; 6) the public success of Social Security in bringing down poverty rates for older North Carolinians; and 7) poverty among working-age North Carolinians Read the entire series here.